Music is an intrinsic part of everyday life, and yet the history of its development from single notes to multi-layered orchestration can seem bewilderingly complex. 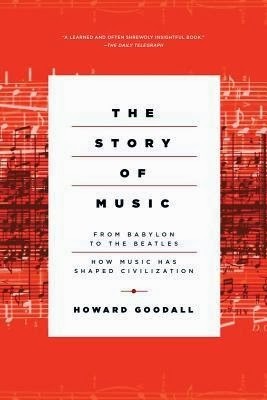 In his dynamic tour through 40,000 years of music, from prehistoric instruments to modern-day pop, Howard Goodall leads us through the story of music as it happened, idea by idea, so that each musical innovation--harmony, notation, sung theatre, the orchestra, dance music, recording--strikes us with its original force. Along the way, he also gives refreshingly clear descriptions of what music is and how it works: what scales are all about, why some chords sound discordant, and what all post-war pop songs have in common. The Story of Music is a great overview of the history of Western music. For those like myself with a strong background knowledge in the subject, there is probably nothing new to learn, although the anecdotes are amusing and the prose is very readable and enjoyable. For those new to the subject, though, this book will be an excellent introduction. Some passages require knowledge of music theory for full-comprehension, but mostly this book is accessible to all readers. A nice addition to any library.